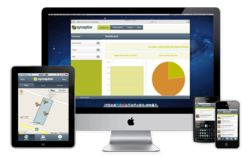 Synaptor is pleased to announce Synaptor Observations: a mobile solution for identifying, reporting, and mapping workplace hazards. We built Synaptor to free workers from the tedium of OHS paperwork and to enable supervisors to manage risk in real time. Synaptor is tackling a space that traditionally hasn’t seen much innovation – workplace safety. The Perth, Australia-based start-up helps companies manage health, safety, and environmental (HSE) risk with a suite of web and mobile applications. The company’s first product, Synaptor Observations, enables workplaces to manage hazard identification and reporting without the delays involved in traditional paper-based systems. Observations consists of free mobile apps for making observations in the field and viewing live maps of all observations made by a team, and a web module for managing observations data. The company’s apps help employees record data in the field, while the web modules help managers, and are available via a monthly subscription. Site workers use the Observations app to record the details of unsafe acts or conditions, including photos. The observations automatically sync to a secure database. The Maps app allows workers to see any hazards on their work site, and receives automatic site-specific safety alerts.